Wed., Oct. 4, 2017, 5:49 p.m. In the wake of this week’s massacre in Las Vegas, organizers of next month’s Play4KayShootout women’s tournament – which includes Gonzaga – have renamed the event. Scheduled for Nov. 23-25 at Mandalay Bay – from where shooter Stepen Paddock killed 58 people and wounded at least 527 – the eight-team tournament is now called the Play4Kay Showcase. Gonzaga is scheduled to play Belmont on Thanksgiving night at 8. 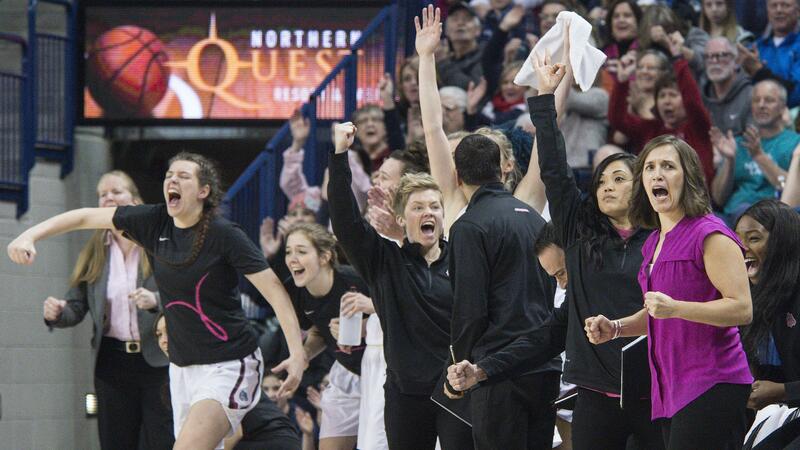 The Gonzaga women can’t wait to get this thing going. As the clock hit 2 Wednesday afternoon and the men were still on the McCarthey Athletic Center court, Lisa Fortier’s players pushed forward. Eagerly. The men got the message, hit a few more free throws and yielded the floor. Moments later, the women were on the court for an enthusiastic first practice of the season. The Zags made some last year in Fortier’s third season as head coach, going 26-7 and winning the West Coast Conference regular-season and tournament titles. “I just can’t believe I’m an upperclassman already,” said Stockton, who along with junior forward Jill Barta and senior guard Emma Stach will help Fortier and her staff develop all the fresh talent on the floor. The next big thing at McCarthey might be the new video board, but Fortier will put a few new bells and whistles on the floor. “And we have a lot of speed,” said Fortier, who will unleash those horses on Nov. 5 in an exhibition game against visiting Northwest Christian. Fans will get a sneak peak during the Fan Fest event on Oct. 14. Fortier’s toughest job this month might be deciding which talented freshmen will be redshirted. Already, Jill Townsend of Okanogan, Washington, is showing rare strength for a true freshman, enough to earn consideration to see the court this year. The Wirth twins, 6-foot-3 forwards Jenn and LeAnne of Chandler, Arizona, “are coming in with a higher starting point than anyone since Barta,” Fortier said. That alone should ease the fears of a dropoff in the frontcourt with the graduation of Kiara Kudron and Elle Tinkle and the leg injury that left post Emma Wolfram on the sidelines Wednesday. GU also returns forwards Zykera Rice and swing Chandler Smith. “Zykera and Chandler had two of the best offseasons we’ve seen in a long time, so we expect them to make an even bigger impact this year,” Fortier said. The key player figures to be Barta, who led GU in scoring (16.8 points per game) for the second year in a row while improving her rebounding and defense. Barta also was solid from 3-point range (36.2 percent) and stellar at the free-throw line (84.7 percent). The backcourt is loaded with experience. Stockton averaged 8 points and 4.3 assists while shooting 43 percent from the field. Speedy sophomore Jessie is a strong backup. Stach, a stellar defender, averaged 5.8 points and shot 37.6 percent from outside. The Zags lost their best outside shooter when Zhane Templeton (41.9 percent from 3) transferred to Texas-Arlington to be closer to family. Published: Oct. 4, 2017, 5:49 p.m.